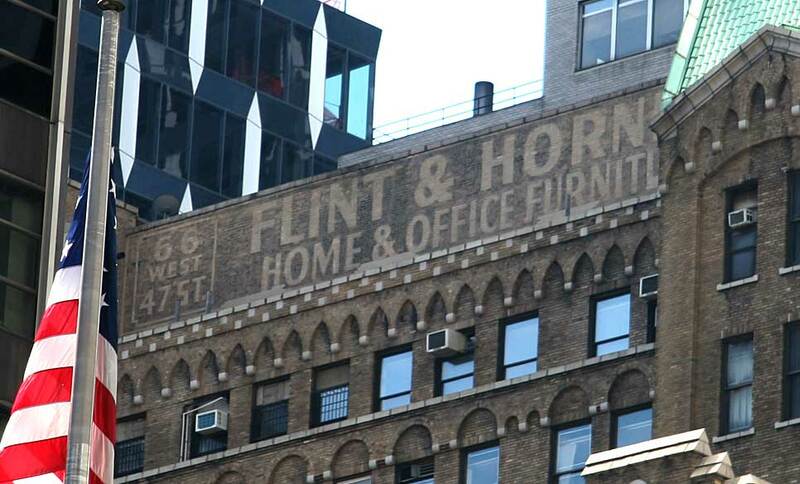 This summary from allexperts.com, "Flint & Horner advertised that its business was founded in 1840. That was the year Henry Bruner opened a furniture business in New York City that was purchased about 1891 by George C. Flint. Flint's business merged with R. J. Horner & Co. about 1914 and was renamed Flint & Horner. It was a New York retail store until at least the 1930s, and it had a reputation for selling high-quality furniture." An exhibition catalog for "19th-Century America: Furniture and Other Decorative Arts," at the Metropolitan Museum of Art, New York City, Sept. 1970, offers, "George C. Flint and Company, successors to the firm of Henry Bruner, was first listed in the 1868 New York directory. A Twenty-third Street address, with three additional addresses, first appeared in the directory for 1894/95; a listing only at Twenty-third Street ran from 1909 until 1913." George C. Flint & Co. did, indeed, appear in Trow's New York City Directory in 1868. The full entry read, "Flint George C. & Co., successors to Henry Bruner, furniture, 396 Hudson & 22 Clarkson." So Flint's purchase of the Bruner business came far earlier than 1891. Robert J. Horner came along in 1885, and these two businesses merged to form Flint & Horner Co. Inc. in 1914. A view of the George C. Flint Company at 43-47 West 23rd Street appeared in Moses King's Photographic Views of New York (1895), available on google books. The ad accompanying this photo mentions Flint's factories on West 19th St.
Ads for both R. J. Horner & Co. and Geo. C. Flint Co. appeared side-by-side in the New York Times, September, 1899. This ad for George C. Flint & Co. dates from 1905 and claims the company was founded 1840. Henry Bruner, cabinetware, was listed in Longworth's New York City Directory for that year. This earlier Flint's Fine Furniture from 1900 gives their address at 43, 45 & 47 W. 23rd St. near Broadway and the address of their factory at 154-156 W. 19th St. This ad for Geo. C. Flint Co. dates from 1909. Apparently 43-47 W. 23rd St. ran through the block to 24-28 W. 24th St. In 1903, along with a very similar Flint ad on the same page of the New York Times, was this one for Horner's Furniture at 61, 63 & 65 W. 23rd St. The first Flint & Horner store was located at 20 W. 36th St., where R. J. Horner & Co. had been since 1912. This was their address until 1926, when they moved to 66 W. 47th St. Flint & Horner were located here on 47th St. until the late 1950s, when they left New York for Manhasset, Long Island. Several passport applications for George C. Flint (1840-1924) from the 1890s indicate that he was born in Boston 23 Oct. 1840. His obituary, New York Times, 13 Nov. 1924, read, "George C. Flint, well known furniture dealer in New York City and a member of the firm of Flint & Horner, 20 West Thirty-sixth Street, died at his home in Stamford, Conn., on Tuesday. Mr. Flint was 84 years old. He was born in Boston, but when still a youth came to New York, where he engaged in the furniture business for the greater part of his life. His first venture was in Hudson Street, but after his business became incorporated it was moved to Fourteenth Street, later to Twenty-third Street and still later to Thirty-sixth Street, its present location." Robert J. Horner (1853-1922) was a native New Yorker. His obituary in the New York Times, 27 Feb. 1922 read, "Robert J. Horner of the firm of Flint & Horner, 20 West Thirty-sixth Street, dealers in furniture and rugs, died early yesterday morning of bronchial pneumonia at his home, 230 West Seventy-sixth Street. He was in his sixty-eighth year. While a boy Mr. Horner went to work for the firm of Mills & Gibb, lace dealers, remaining with them many years and working himself up to a responsible position. Later he formed the furniture house of R. J. Horner & Co., located in West Twenty-third Street. Eight years ago the firm became Flint & Horner and moved to its present location in West Thirty-sixth Street. Mr. Horner retired from active participation of the affairs of the company three years ago. He was a Director of the Garfield National and Excelsior Banks, and President of the Flower Waste and Packing Company. Funeral services will be held at 1 o'clock on Tuesday afternoon in the Campbell Funeral Church." This is a Flint & Horner ad from 1917, when they were located at 20 W. 36th St. This photo of a Flint & Horner label on a desk chair was sent to me by a former colleague at the New York Public Library. This view along 47th St. by the Wurts Brothers in the New York Public Library's Digital Collections shows a Flint & Horner sign on the East wall of 66 W. 47th St., as well as an overhang sign on the front of the building.